Put all of your new knowledge (and equipment) to use during this backpacking day trip. Participants will meet at the Gerald E Eddy Discovery Center and hike to Green Lake Rustic Campground. There are fire pits, pit toilets, and a water pump. Approximately 4.8 miles of hilly terrain one way (9.6 miles total). During the hike, instructor Ben Wielechowski will give brief demonstrations on various water purification techniques, ‘bear-baggin,’ and other backpacking techniques. Participants will prepare one meal during the day. Children 12 and older are half price with accompanying adult. Meet at the Eddy Discovery Center. Class organized by Robin Hills Farm. Our Backpacking classes will cover planning, gear, logistics, making your own DIY camp stove, and a backpacking day trip (10 miles round trip) in the Waterloo Recreation Area. 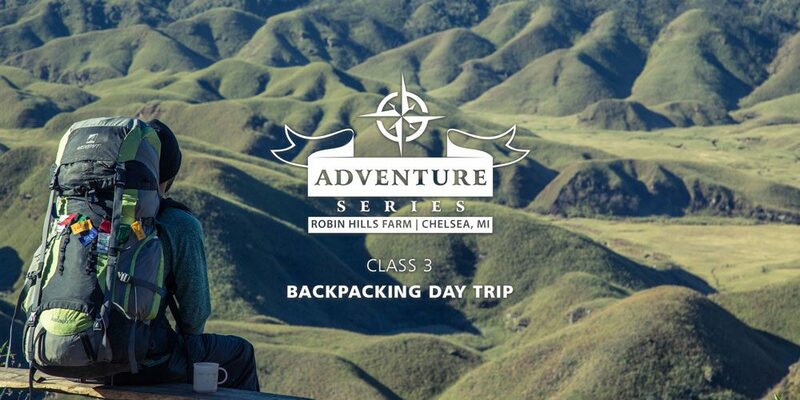 See www.robinhillsfarm.com/backpacking for more information.